Is scientific investigation limited with respect to answers it can uncover, leading to inevitable uncertainty? 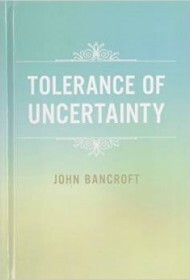 In Tolerance of Uncertainty, John Bancroft asserts that limits do exist, and, more importantly, many individuals cannot tolerate the existence of uncertainty. He argues those who do tolerate uncertainty are able to reach less biased, more useful conclusions. Bancroft, a medical doctor and psychiatrist, developed an interest in researching human sexuality. As his career progressed, he realized that human sexuality was far too complex to fully understand; any investigation led to variable, uncertain answers. He began to consider uncertainty in other areas, such as spirituality, ethics, and morality. The purpose of Tolerance of Uncertainty is to explore what uncertainties exist in the world and whether or not there is a propensity in human nature to either tolerate or be intolerant of uncertainty. Bancroft meticulously examines research into gender identity; sexual identity; the development of morality and sexual morality, in particular; world religions; the subjugation of women in various religions and cultures, and many other aspects of life and culture. His exploration of these concepts is brilliantly thorough and unbiased. One of his most fascinating conclusions is that, while many want to claim morality is unchangeable and based on objective truths, our notions concerning what is moral behavior have actually changed over time and continue to change. Thus, he concludes, no one will fully understand the development of morality nor be able to claim with certainty what truly is and is not moral. While the content is dense, Bancroft’s style is so well organized and his conclusions so clearly stated that many will agree with his conclusion that there needs to be a “tolerance of uncertainty” when investigating the unknown. “There is no place for certainty!” he exhorts. Those who enjoy science, philosophy, history, and even socio-cultural studies will particularly appreciate reading the theories he lays out, the body of evidence he presents, and his conclusions in this intriguing book. BlueInk Heads-Up: This book receives a Star designation with the recognition that the text features a mix of American and British-style punctuation that might be distracting to readers of both countries.